The Denver Nuggets will host the San Antonio Spurs on Wednesday night in the NBA, as both teams will be on the end of the back to back after playing last night as well. The Nuggets (51-26, 31-7 home) suffered their 4th loss in 6 games last night in Golden State, as they got blown out by the Warriors, and saw their chances to claim the first seed drop significantly. 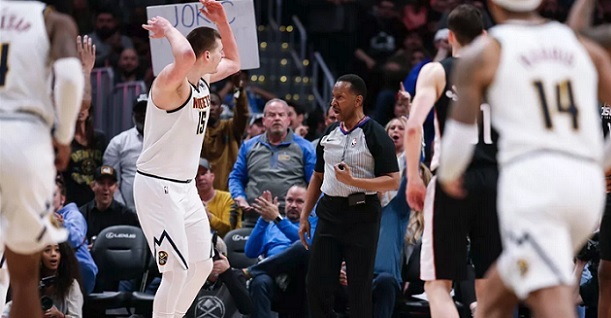 The Nuggets really didn`t play well, they were overwhelmed by Golden State, and will now probably shift their focus to defending the second seed in the West – as the Rockets are just 1.5 games behind. The Spurs (45-33, 14-24 away) have their own fight for these last few games of the season, as the visitors can realistically finish anywhere from 5th to 8th in the West. The Spurs are coming after a tough home win against the Hawks last night, when they needed a big 4th quarter to edge their opponents by 6 points. They will now attempt to win consecutive games for the first time since mid March. Bet on Nuggets v Spurs and get your 100% (120 Eur) welcome bonus at LSbet now! Team news: There are small doubts over Jamal Murray for the Nuggets, but he is expected to play, and is the only injury worry for the hosts. The Spurs are also at full strength. Both teams are on a back to back, but the Spurs are in a much more difficult and vulnerable position here. First of all, they had to play their main guys a lot of minutes last night, while the Nuggets rested their players since their game was over since the middle of the 3rd quarter. Nobody played more than 29 minutes for the Nuggets last night, while the Spurs had to use Aldridge 38 minutes and DeRozan 36. The Nuggets will also have the comfort of their own home, in Denver. The special conditions here (the high altitude) will make it even tougher for the Spurs. With their main players having to work hard last night, they now have to go play in the most difficult conditions in the NBA. Denver`s particular home court advantage should have a crucial impact in this back to back situation here. After all, it`s no fluke that they are 31-7 home. Spurs on the other hand have been rather poor on the road all year (14-24). The Nuggets are the better team and should have enough energy left in them to bounce back after a bad performance last night, while the Spurs might feel the altitude in Denver and end up running on an empty tank here. Odds are dropping on the Nuggets right now, surely due to the reasons mentioned in this analysis. The point spread stands at -5 points and it`s tempting to take the handicap on the hosts here, but I will choose to go with the straight win for extra safety. My tip will be Denver to win. Prediction: Denver Nuggets – San Antonio Spurs 117 – 105.